Are you sitting at home and can’t seem to figure out why it is hotter in your house than it is outside? Have you constantly tried adjusting your A/C thermostat, checking your filter and troubleshooting the unit yourself? If you have done the above and you are still experiencing discomfort due to a faulty air conditioning system, it may be time to schedule a service call with Logan Services. A Logan Services technician will be sure to uncover the root cause of system issues. 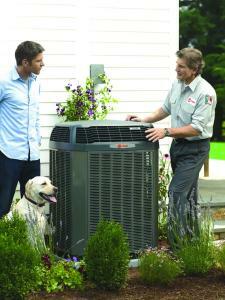 We also offer routine maintenance to extend the life of the system and avoid future problems. When the cost of repair outweighs the cost of replacement, our technicians can also provide you with a free estimate on a new system while they are there in your home! If you are in need of emergency maintenance be sure to call Logan Services of Columbus, Dayton or Cincinnati, Ohio to serve your needs. Schedule a service appointment today!